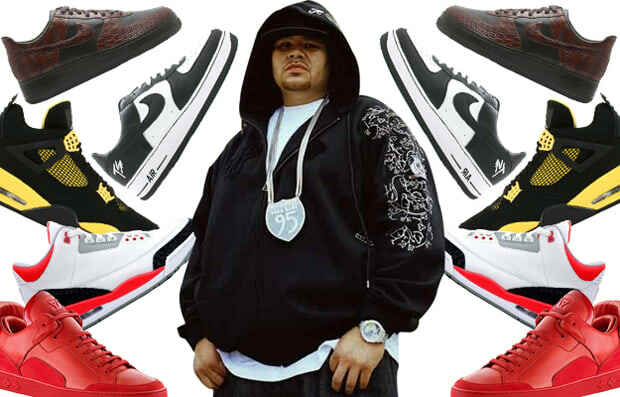 When it comes to the sneaker-game, Fat Joe is a heavyweight. The dude has an extensive collection of one-offs, rare Air Force 1s, Jordans, and other grails we'll never get our hands on. Before there was a Croc Air Force 1, there was a one off Fat Joe Croc Air Force 1, that's just how it is. His new single "Ha Ha (Slow Down Son) continues to 'cause havoc in the clubs (trust us, it rings off nice), so we continue our weekly celebrity spotlight and take a virtual tour of Joey Crack's sneaker closet. Or what he brings out to show off, anyway.